5 Hair Products You Won't Be Able to Live Without! If you’re anything like me, you need to have one of every hair tool/styling product out there. I need a curler, a flat iron, a blow dryer, a wide barreled crimper, and various products ranging from heat protectants, hair masks, frizz fighters, and everything in between. Being a college student, money isn’t always flowing so I’d prefer to make an investment that will give me the best for my bucks and that will last a long time; with that in mind, I thought I would share a few of my most essential picks! If I go on a trip anywhere, no matter how short or long, this guy comes with me. Not only is it slim and easily packed into a suitcase or duffle bag, but it also creates a wide range of styles. If I need to travel light and can’t bring my wand, I know I can count on my iron to achieve curls, waves, or totally flat hair! 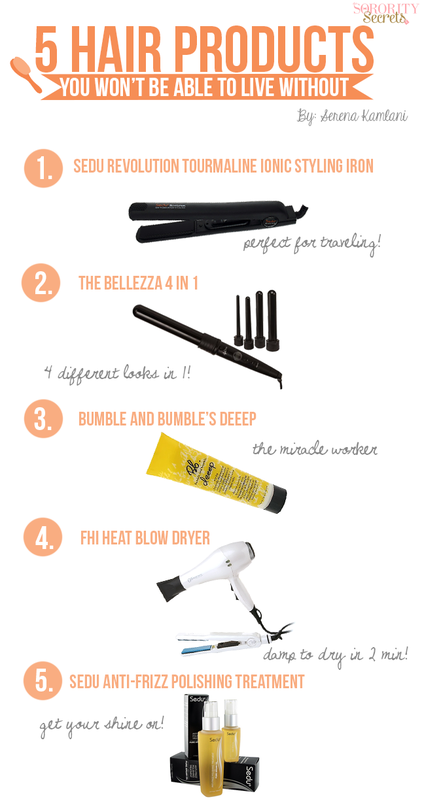 If you want the most for your money for the perfect wand, this is where you can find it. This wand is unique because it comes with 4 barrels in different diameters so you can have perfect curls of any size. It heats up quickly and is easy to use with arrows that allow you to select your desired temperature. Plus, it works pretty quickly, too. It’s a high quality hair styling tool with ceramic ionic barrels that won't make your poor ends feel dried out and crusty. Finally, with the interchangeable heads the wand comes apart and can be easily stowed in a small makeup bag. What more could you want? This one is a little more expensive, but I promise it’s worth every penny. As much as I try to reduce styling my hair and causing heat damage, from sorority socials to philanthropies and work, I find myself having to style my hair every day! Just 20 minutes of this amazing protein masque- it leaves my hair feeling so much more alive. The only thing you need to be careful of when using this product is not to leave it in for too long. I tend to leave masques on my hair longer than necessary to maximize the effect, but with a protein masque too much protein can have a reverse effect and make your hair brittle. Overall, this product is amazing and it's definitely worth a try! Every girl needs a blow dryer- Most of us women live life on the go, and many of us are always in a rush. When I say I’ll be there in 5 minutes, it means I’m still tugging my iron through my hair one more time and making sure my eyelashes are evenly coated with mascara. The great thing about the FHI Heat is that it significantly reduces drying time, even for those of us with very thick hair. But my absolute favorite part of the FHI Heat is that it comes in pink! Can you tell I have a slight obsession with Sedu? You probably will too after you try it! This treatment acts as a heat protectant, moisturizer, and anti frizzing agent. You may have heard of putting Argan oil in your hair for moisture and shine- well this product has it all. I use it before any kind of heat styling, and sometimes just to reduce frizz. The serum is easy to distribute through your hair and makes styling a breeze. Additionally, while the bottles aren’t cheap, one lasts a long time and a little bit of oil goes a long way.